In recent years, there has been ample recognition towards the importance of fats in our diet. In particular, omega-6 and omega-3 fats have been regularly promoted as healthy fats. However, their glowing reputation can make these two omega fatty acids inaccurately seem as though they are equally beneficial. So then how are they different? The key difference is that omega-3 fatty acids act in an anti-inflammatory manner; that is fight against inflammation, whereas omega-6’s act in a pro-inflammatory manner, that is promote inflammation. So what does this mean for my health? The contradictory inflammatory roles of omega-6 and omega-3 means the balance between them is delicate. Yet, in most cases, there is a severe imbalance, with most diets tending to tip heavily in favour of omega-6 fats, which are pro-inflammatory. The term ‘inflammation’ generally has a negative undertone, bringing to mind images of red, painful swelling. But inflammation is a necessary, natural response to stress, and it only becomes a problem when it is excessive and long-lasting, being linked to a number of conditions, such as obesity, heart disease, cancer, and depression. Imagine inflammation as a smoke alarm. If one alarm is triggered it’s helpful to find and extinguish what is likely a small fire. If multiple alarms are triggered, the fire is larger, much more difficult to extinguish and highly likely to continue spreading. How can you perfect your balance? Before you consider omega-3 the “good guy” and omega-6 the “bad guy” it’s important to [OC1] reiterate that both are essential, healthy fats. The problem is that most current western diets consist of ratios upwards of 15:1, while the ideal ratio for omega-6 to omega-3 is between 2:1 and 4:1. For most, to achieve an ideal ratio there needs to be a simultaneous reduction in omega-6, while increasing omega-3. How can you increase your omega-3’s? Research has consistently demonstrated that people who eat more fish have less inflammation. This is thanks to two anti-inflammatory omega-3’s known as EPA1 and DHA,2which are obtained almost exclusively through eating fatty-fish, such as salmon, mackereland trout. The other omega-3 is a fatty acid known as ALA, which comes from eating plant foods. Although ALAis not technically anti-inflammatory, the body is able to convert it to the highly coveted EPAand DHA. Hemp seeds are a source of this omega-3, along with flax and chia seeds. Try them added to a smoothie, sprinkled onto a salad, or stirred through yoghurt. How can you decrease your omega-6’s? The most impactful thing you can do is to eliminate refined vegetable oils rich in omega-6 from your diet, which includes the processed foods that contain them. Instead, choose to eat oils with ideal ratios in their natural state. As an example, the omega-6 to omega-3 ratio of hemp oil is 3:1, which is an excellent ratio but also makes it unstable to cook with, so use it as a healthy dipping oil or a salad dressing. You are what you eat, which also means you are what your food eats. Feeding livestock grain can change their fatty acid ratio to be more favourable towards omega-6. Choosing grass fed can provide you with a healthier balance of fats. Understanding inflammation is key to understanding the role of omega fatty acids. 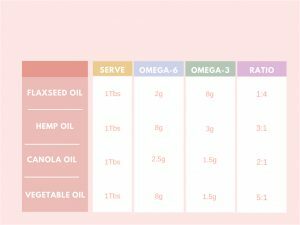 For most, in order to promote healthy inflammation, the ratio between omega-6 and omega-3 needs to be reduced, which can be easily achieved through a few smart diet decisions. Article by Bridget Scrogings, Accredited Practising Dietitian.